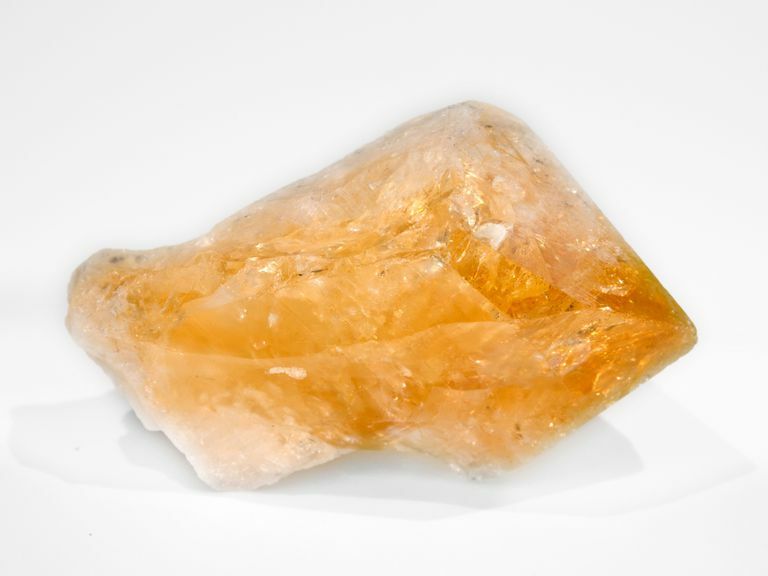 Citrine is a yellow quartz that has been associated for centuries as possessing the healing properties of the sun, but it can also be greenish-yellow, brownish-yellow, or orange. The mineral is often found in association with amethyst, but it is much rarer than its purple cousin. Indeed, citrine is made by heat-treating amethyst. Like all quartz, citrine is made of silicon and oxygen atoms arranged in a tetrahedral pattern, essentially a triangular pyramid. Citrine is found in a large number of locations, including France, Britain, Russia, Madagascar, Burma, Spain, U.S., and Brazil. But the crystal—and its purported healing powers—dates back centuries, to the time of the ancient Greeks. The word "citrine" comes from the Greek word meaning citron, as many of the earliest crystals found had a color similar to the citrus fruit of that name. As noted, citrine is formed by heat-treating amethyst, specifically purple amethyst. Heat treating, in relation to minerals, gems, and crystals, refers to the process of enhancing a gemstone to give it a more desirable color or remove its flaws by subjecting it to very high temperatures. The heat treatment is also thought to give citrine more powerful healing powers than its gemstone cousin. The color is key here: The heat treatment expands the auric field of the crystal, filling it with light and clearing away any lingering etheric toxins. Citrine is also a manifestation crystal that can motivate you to take action. It brings optimism and cheerfulness. Citrine is a good stone for aligning all the chakras (energy centers). It focuses on balancing the solar plexus chakra, which in turn integrates the lower and higher chakras. Acts as a manifesting stone: A manifestation, used in the context of working with crystals, refers to a person's projecting and programming her intention into the crystal being worked with. In essence, the crystals absorb what is called your manifestation wishes—your deepest hopes and dreams—then help make them a reality. Dispels anger and gives optimism: All of this light that citrine provides means that citrine cannot tolerate negativity. Spread some crystals in your garden to bring light to your plants and help them grow. Being in contact with citrine, as it channels the light-giving power of the sun, helps you cast aside negative feelings and aids any sun-loving entities (such as plants) to grow. Aids digestion: This spiritual light also helps to detoxify your system, says Crystal Informaition.com, which in turn, helps to ease and aid digestion. Gives mental clarity: Being in contact with this light-generating crystal is thought to help boost your creativity, visualization powers, and confidence. Two of the above-mentioned benefits of citrine are particularly important to its healing power and deserve further discussion. Citrine's energy and color are the reasons that this stone is associated with the sun. The stone drives out darkness and night fears and helps to protect against negative people. It also is good for prosperity. Intuition can be increased with this stone and it can help you to discern your inner voice from free-floating anxiety. Because of this, the gem holds energy for very long periods of time and doesn't need to be recharged often. As a gem that does not absorb or give off negative vibes, citrine harnasses the light, the power of the sun, to help you manifest your goals and remain cheerful. It attracts an abundance and personal power. It stimulates the body's own healing energies. It is good for helping to elevate self-esteem and is good for centering. Because the citrine cannot hold negative vibes, it instead dissipates and transmutes good feelings. Citrine is a good stone for clearing your aura. Your aura is like a magnet picking up vibrational energies that are all around you in an energy field. Put another way, your aura is a field around your physical body. Since the light-emitting citrine helps infuse your aura with light and positivity, it is a perfect gem to help you create a positive, mentally clear attitude.